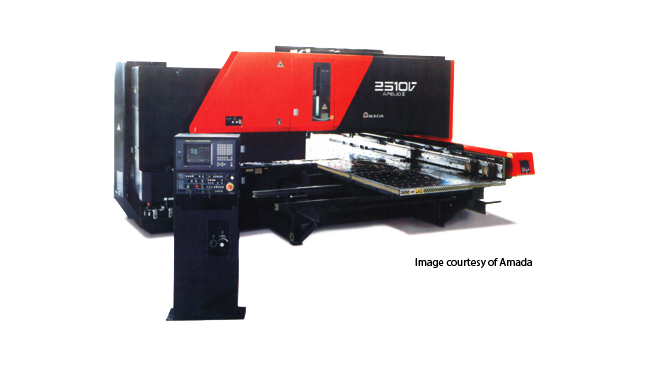 The 2610V from Amada's Apelio III series is a great punch-laser machine for sheet metal working. When you combine the flexibility of a laser machine with a fast turret punch machine, you get an ideal scenario for small batch and high volume jobs. Using the punch, it can achieve over 1000 HPM and a high 410 HPM on a 25mm pitch using its hydraulic ram that is intelligent serve-controlled. This machine also has three auto index stations which can rotate three tools 360 degrees with a rotation increment as low as .01 degrees. This helps lowering the setup times and providing great flexibility. Using the laser, it can handle about 140 holes per minute on thin sheet metal materials. This machine can still cut steel material as thick as 12mm. The SMP CAD/CAM software by Merry Mechanization works well with this Apelio III 2610V combination (punch/laser) machine.